Why Do I Like Sailor Moon? It’s definitely not good television. We’re not talking Babylon 5, Deep Space Nine (some seasons anyways), Downton Abbey, Sherlock, or The West Wing here. We’re not even talking most of Doctor Who, although the cheeziness factor of both shows can be high at times. Well, every so often the show will surprise me with a depth of feeling that comes screaming out of seemingly nowhere. This is probably one of the first shows I’ve watched that didn’t belittle what might be traditionally thought of as female pursuits. And where the cast is largely female, which is pretty damn unique. And on the show, homosexuality is pretty much accepted and a non-issue—look at the relationship between Sailor Uranus and Sailor Neptune. (In fact, they’re one of the center points of that picture.) I know that in the US at least they were turned into cousins, but I’m really not sure that made things, ah, “better” for a homophobic version of “better”. 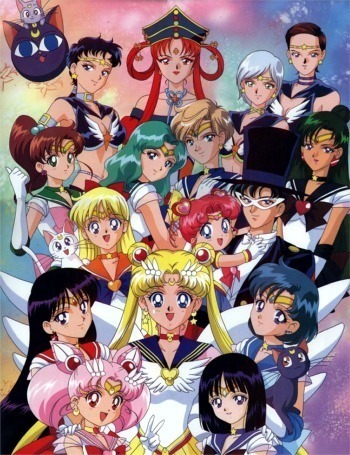 And when I think about the Sailor Starlights, I get shivers of awesome, because they gender-bend literally. One of them falls in love with the main character, and considering that these are women in men’s bodies (some of the time), it’s just… awesome, so awesome. It’s a romance across the aeons. Overly romantic. And of course, I find I’m an incurable romantic. If I ever get to go to a convention, I want to cosplay as Tuxedo Mask. Point, point, I had a point somewhere. Ah yes. I think there are definitely lessons for me to take away, storytelling-wise, such as writing realistic female characters that aren’t simply women who’re part of the boy’s club, something I’ve strived for all my life. And then there’s some of the serial aspects of storytelling, but I’m concentrating less on the monster-of-the-episode aspects and more on the character and relationship development.